I couldn’t go past the fifth day of Christmas without making rings of some sort. 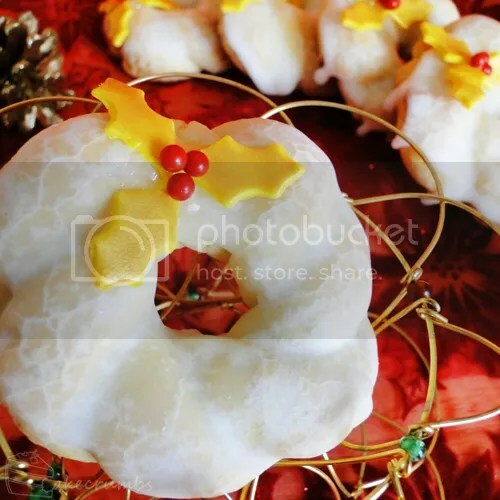 Cookie wreaths seemed like the perfect option, but which recipe? 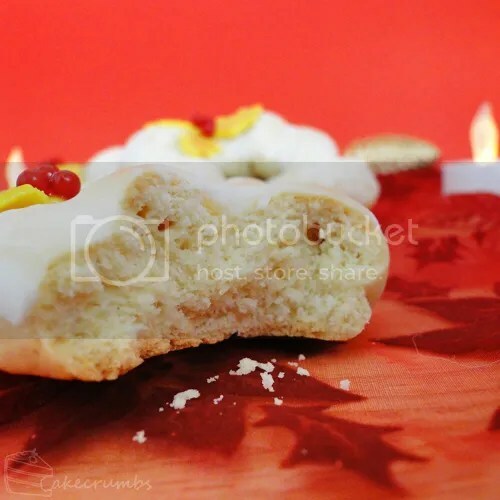 I was tempted to make some piped shortbread, but after having made some Christmas shortbread already this year, it had to be something a bit different. These Italian lemon biscuits were the perfect alternative. The white glaze did hide much of the lovely golden colour of the biscuits, so I adorned them with a little golden holly to make up for it. 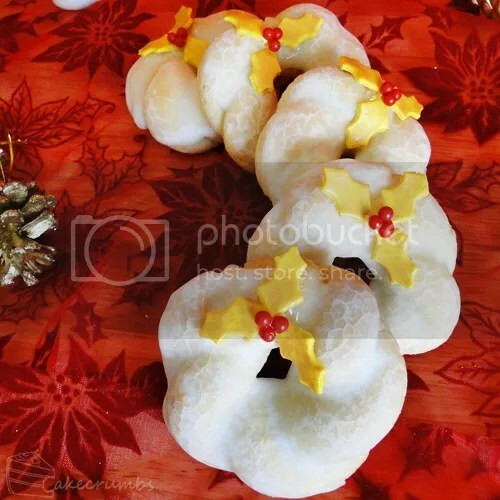 The dough holds its shape perfectly for forming a wreath cookie. The lemon glaze is not only delicious, but provided a refreshing change from some of the rich stuff we’ve had lately. They’re also really quick and simple to make, unlike what’s coming up for Day 6, so it made for a nice change in the kitchen as well. Preheat oven to 180­°C (160° fan-forced). Grease or line baking tray(s). Rub butter into flour using your fingertips until the mixture resembles fine breadcrumbs. Place milk and sugar in a small saucepan; stir over medium heat until sugar dissolves. Remove from heat; stir in vanilla. Gradually mix milk mixture and egg into the flour. Mix until well combined, then turn onto a lightly floured surface and knead until smooth. Roll tablespoonfuls of the dough into a thin sausage; twist two of them together to form a twisted rope. Join rope at the ends to make a closed circlem then place on baking tray. Bake for 15-20 minutes, until biscuits and golden. Transfer to a wire rack to partly cool; dip tops of biscuits until the lemon icing, then return to the rack to cool completely. Combine icing sugar and lemon juice in a heatproof bowl to form a paste. Place bowl over a small pot of gently simmering water; stir until sugar melts and mixture is runny. Very tasty and very cute. Like you said, shame you couldn’t see the texture of the biscuits, but I love the patterns formed in the icing.